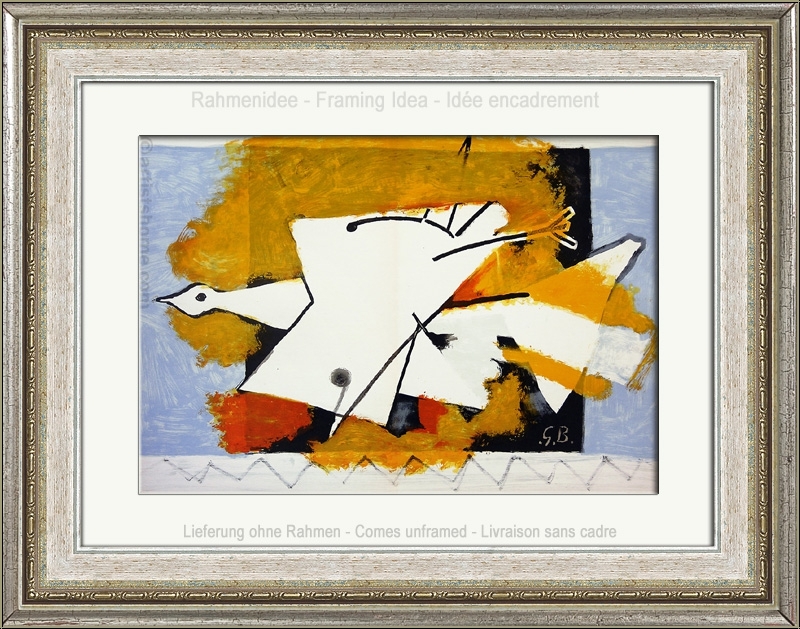 "The yellow bird" (which is, strictly speaking, a white bird in front of a yellow background) is considered to be one of the rarer large-format and colourful graphical works of Braque. With this sheet, the lithographer* has succeeded in perfectly reproducing the brushstrokes of the original oil painting. On this colour lithograph, you can see the thickness of the individual colour layers with the naked eye, and also the order in which the colours were applied. For Braque, who was known to be a perfectionist, it was not uncommon that lithographers and printers had to produce a two-digit number of sample prints before the artist concluded that the work was "bon à tirer" and could be printed. Edition: One of about 3000 impressions from the unsigned edition. 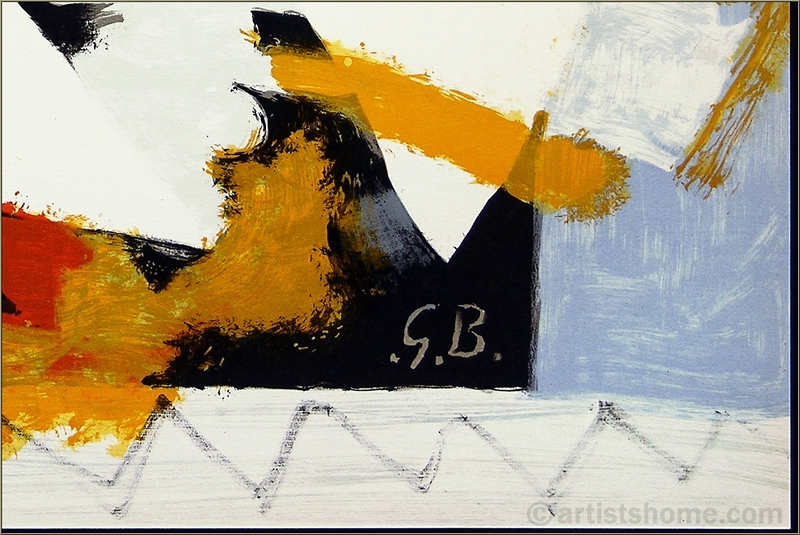 In addition, 300 impressions on wove paper with full margins were pulled and pencil-signed by the artist. 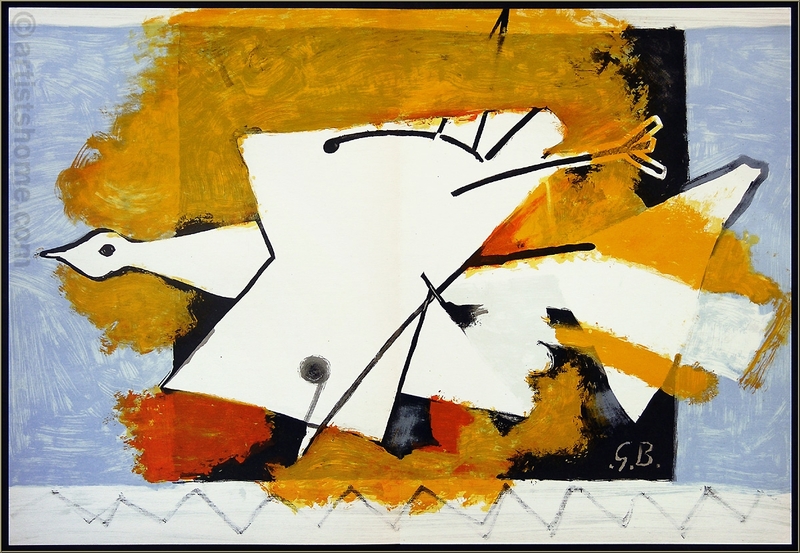 Remarks: *This print is not an original lithograph by Georges Braque, but was produced in 1959 by one of the lithographers of the famous Mourlot studio in Paris, who used to work for Braque. It is based on one of Braque’s paintings. Nevertheless, the work is not an art print at all. Vallier or Maeght, respectively, write in the catalogue raisonné for these works: "He [Braque] was involved in the production of these prints, he supervised and guided the work of the engraver or lithographer, he himself revised several pieces, corrected the prints and then gave his final approval by signing each exemplar." This unsigned exemplar is also an authentic print, since it was produced with the same stones and in the same year (1959) as the signed prints. Just to clarify: the signed prints are also not original lithographs, even though this is often claimed and they are offered for 4-digit sums. This large lovely colourful piece, with a light center fold, an absolute "must" for Braque amateurs. Very competitively priced as with many others from Artistshome. Excellent packing and delivery as with a dedicated service from Christine Blenner who works around the clock to satisfy and reply to email enquiries, no matter how many!